In November, last year, The Academy of Psychosomatic Medicine, Bethesda, Maryland, held its drug company sponsored 56th Annual Meeting in Las Vegas, Nevada. 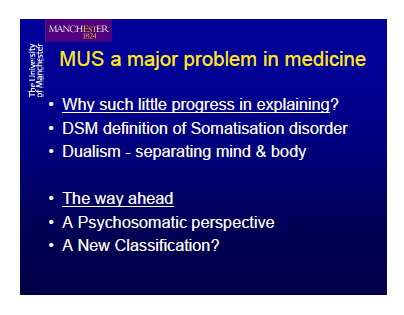 Three DSM-V Work Group members, Francis Creed, Lawson Wulsin and Joel Dimsdale (Chair, Somatic Symptom Disorders Work Group) gave presentations around “Medically Unexplained Symptoms” (MUS) and DSM-V, and DSM-V proposals and progress. Slides are available, below, for the first two presentations, with text for the third. This material represents the most recent information around the deliberations of the DSM-V Work Group that is revising the categories currently under DSM-IV “Somatoform Disorders”. See this Dx Revision Watch page for previous updates from this Work Group. “The Academy of Psychosomatic Medicine recognizes and appreciates the significant financial support provided by the following companies for the 56th Annual Meeting. Bristol-Myers Squibb and Otsuka Pharmaceutical, Inc. 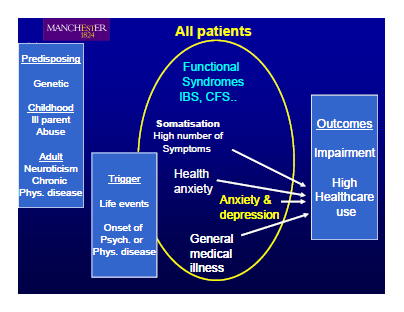 The Somatic Symptoms Workgroup was charged with reviewing most somatoform disorders, psychological factors affecting medical condition, and factitious disorders. There is considerable confusion regarding the diagnostic terminology and a reluctance to use these diagnostic labels. In addition to relying on expert opinion and the research literature, the Workgroup has also been conducting studies in an effort to learn how physicians actually use these diagnostic labels. These diagnoses are rarely coded. In a study of >1,000,000 Virginia Anthem Blue Cross policy holders, Levenson  found that there were fewer than 600 patients with such disorders. Of these 600 patients, the largest group of patients were diagnosed with Psychological Factors Affecting Medical Condition. Four focus groups were held in San Diego and Edinburgh. Psychiatrists from very different practice settings attended these groups (child psychiatrists, forensic psychiatrists, psychopharmacologists, consultation psychiatrists, psychotherapists). Nonpsychiatrist attendees included neurologists, pediatricians, and gastroenterologists. Using themes identified from the focus groups, an anonymous internet poll was designed. Using mailing lists from a variety of professional organizations, physicians were invited to respond to an anonymous poll. Three hundred thirty-two physicians responded to the poll. Two thirds were psychiatrists; two-thirds were from the United States. 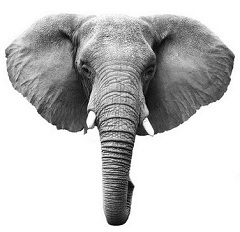 While in general, physicians reported that somatoform patients were relatively rare in their practices (i.e. 0-2%), some physicians reported high prevalence of these patients. Over 30% of the physicians regarded the diagnostic guidelines for pain disorder and somatoform disorder not otherwise specified as “unclear.” Similar numbers of doctors regarded these particular disorders as “not useful.” Physicians were uniform in their opinion that patients disapproved of such diagnostic labels. Respondents also felt that there was a great deal of overlap between somatization disorder, pain disorder, hypochondriasis, and somatoform disorder not otherwise specified. In addition, they felt that that there was overlap between the somatoform disorders and anxiety and depressive disorders. 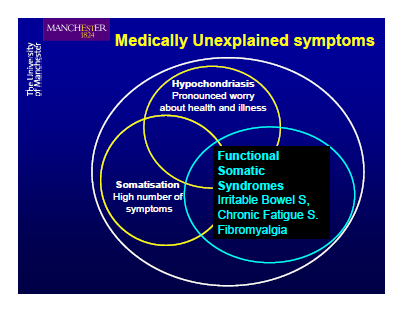 The Somatic Symptoms Workgroup has been struck by the fact that “medically unexplained symptoms” (MUS) comprise the crucial intellectual underpinning of the large group of somatoform disorders; yet MUS designations are perilous. They foster mind-body dualism; they confuse “undiagnosed” with “unexplained”; they contribute to doctor-patient antagonism; and they base a diagnosis on a negative, rather than positive criteria. The Workgroup is proposing a series of changes to these disorders. First off, such disorders would be grouped together under one rubric entitled “Somatic Symptom Disorders”, which would include somatoform disorders, factitious disorders, and psychological factors affecting medical condition. 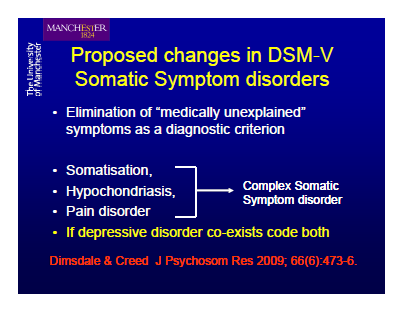 Second, because of their many common features, the group is proposing that hypochondriasis, pain disorder, somatization disorder, and undifferentiated somatoform disorder be grouped together as “Complex Somatic Symptom Disorder”, with optional specifyers to designate when the predominant presentation is, for instance, hypochondriasis, etc. MUS is de-emphasized for this diagnosis, which would require both prominent somatic symptoms causing distress or dysfunction, as well as positive psychological criteria (behavior, cognition, perception). A draft description of these and other disorders will be published on the APA’s DSM V website in January, 2010. The workgroup welcomes comments from colleagues about the proposed changes. Are the proposed changes on the right track? Does this proposal represent, all in all, a step forward? Are there major adverse unintended consequences? Workgroup members include: Arthur Barsky, Francis Creed, Javier Escobar, Nancy Frasure-Smith, Michael Irwin, Frank Keefe, Sing Lee, James Levenson, Michael Sharpe , Lawson Wulsin, Joel Dimsdale (chair). Please send comments to Joel Dimsdale via email jdimsdale@ucsd.edu . Francis Creed, MD, is a member of the DSM-V Somatic Symptom Disorders Work Group (aka Somatic Distress Disorders Work Group) and was a member of the international CISSD Project, co-ordinated by Dr Richard Sykes, PhD. He is a co-editor of the Journal of Psychosomatic Research. Lawson R. Wulsin, MD, is a member of the DSM-V Somatic Symptom Disorders Work Group. Joel E Dimsdale, MD, chairs the DSM-V Somatic Symptom Disorders Work Group, is a member of the DSM-V Task Force and was a member of the CISSD Project. James L Levinson, MD, is a member of the DSM-V Somatic Symptom Disorders Work Group and was a member of the CISSD Project. Michael Sharpe, MD, Director, University of Edinburgh Psychological Medicine Research Group, is a member of the Somatic Symptom Disorders Work Group, a co-PI of the UK MRC funded PACE Trial and was a member of the CISSD Project. Francis Creed is currently working with EACLPP colleagues, Henningsen and Fink, on a draft white paper for the EACLPP MUS Study Group called: “Patients with medically unexplained symptoms and somatisation – a challenge for European health care systems”. A copy of the MUS Study Group working draft can be downloaded from the EACLPP site. The January 2010, Editorial “Is there a better term than “Medically unexplained symptoms?” Creed F, Guthrie E, Fink P, Henningsen P, Rief W, Sharpe M, White P. J Psychoso Res: Volume 68, Issue 1, Pages 5-8, discusses the deliberations of the EACLPP study group. The Editorial also includes references to the DSM and ICD revision processes. Javier Escobar, MD, Director of the University of Medicine and Dentistry of New Jersey (UMDNJ) – Robert Wood Johnson Medical School (RWJMS) Medically Unexplained Physical Symptoms (MUPS) Research Center, which has been supported with over $4M in funding by the US National Institute of Mental Health (NIMH), is a member of the DSM-V Task Force. Dr Escobar serves as a Task Force liaison to the Somatic Symptom Disorders Work Group and is said to work closely with this group. “…Perhaps as a corollary of turf issues, general medicine and medical specialties started carving these syndromes with their own tools. The resulting list of ‘medicalized’, specialty-driven labels that continues to expand includes fibromyalgia, chronic fatigue syndome, multiple chemical sensitivity, and many others. Marin and Escobar August 2008 Special Report here on Psychiatric Times site.